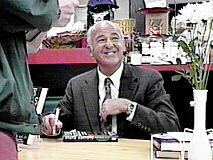 On Friday January 10, 1997, Allegheny County Coroner Cyril Wecht spoke to an assembly of 80 people at Mystery Lovers Bookshop in Oakmont, Pennsylvania. Dr. Wecht discussed cases from his current book, "Grave Secrets" and from his previous work, "Cause of Death." Select one of the links below to hear an audio excerpt from Dr. Wecht's talk. by Cyril Wecht, M.D., J.D.